From left to right, Vic Campbell, Tommy Flowers, Todd Wrightson and Margaret Seidl. 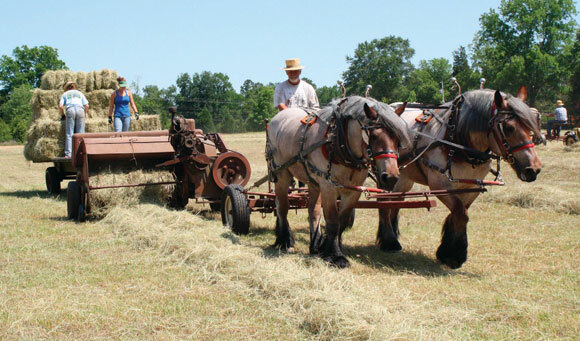 During a spell of good weather in early June this past summer, Tommy Flowers invited some of his friends to visit and bring their horses to help put up some hay on his Blackville, S.C., farm. The 10 acres of hay was thin so the work went quickly and by the time they were done they had brought in 390 small square bales and 3 round ones. They used four mowers, one tedder, two rakes, three forecarts, one baler and three wagons over a three day period. 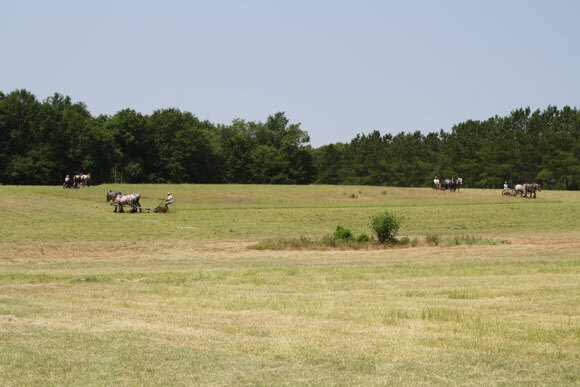 Tommy had his three Brabants and one blue roan Percheron working and was joined by Todd Wrightson of Trinity, N.C., with his team of Percherons, and Vic and Gail Campbell of Greer, S.C., and their team of Brabant crosses. Joining them in the work was Vic and Gail’s apprentice, Margaret Seidl, Todd’s nephew Elijah, and Tommy’s daughter, Hannah. Tommy moved the round bales with a round bale hauler from Tractor Supply Company rigged with a battery and switch to lock the hauler's brakes. When you want to pick up the bale, you just back up onto it. When you want to dump the bale you just lock the brakes, back up and it unloads. 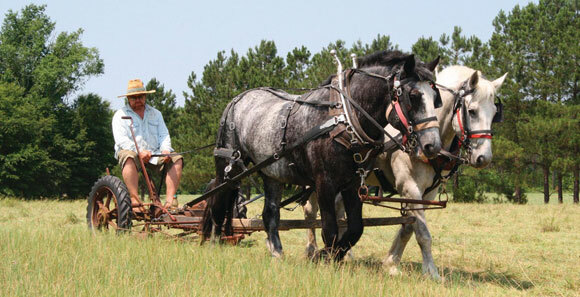 Todd Wrightson mows with his Percheron team. Margaret Seidl drives Vic Campbell's Brabant cross team while Vic operates the engine-powered tedder. Vic Campbell rakes with his Brabant cross team. 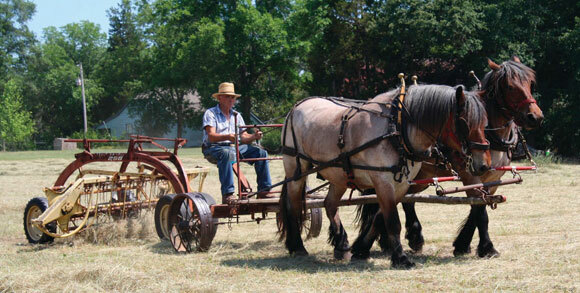 Tommy Flowers drives his Brabant horses pulling the New Holland #68 hay baler fitted with a 17 horsepower engine. Hannah Flowers and Margaret Seidl stack the bales. 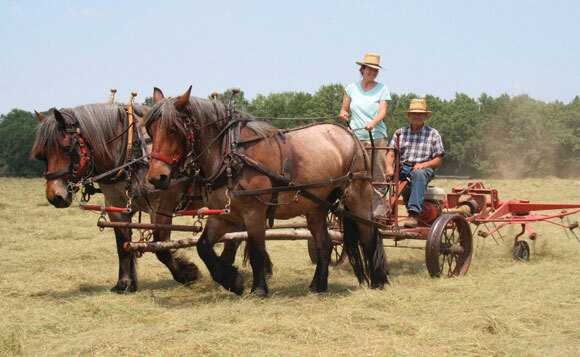 Tommy Flowers moves a round bale with his team of Brabants as Margaret Seidl watches. The round bale mover is a a Tractor Supply model. The haying crew included, seated from left to right: Vic Campbell and Margaret Seidl. Standing: Todd Wrightson, Todd's nephew Elijah, Tommy Flowers, Cindy Flowers and Hannah Flowers. 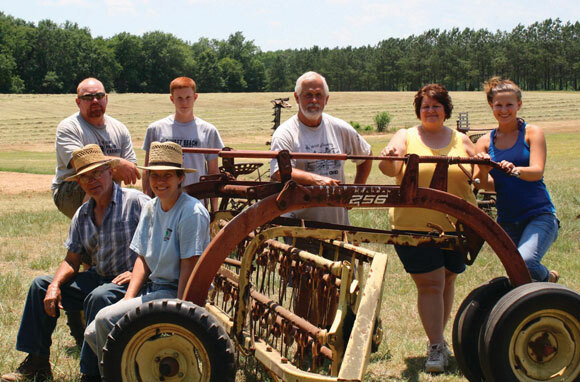 This article appeared in the October/November 2011 issue of Rural Heritage magazine. This file last modified: February 26 2018.